This absolutely gorgeous home is a newer build in an incredible location! Located in a cozy cul-de-sac just behind the protected Swan Lake Creek and the coveted CCAA Gardens, this is a home you can be sure will never have construction in front of it. While neighborhoods elsewhere endure growth and construction, yours will always be peaceful and echo that of the deep countryside while enjoying the benefits of Uptown around the corner and Downtown and the Westshore just a quick drive in either direction. The home has hardwood and ceramic tile flooring throughout and a bright South facing open floor plan with a beautiful and well-planned kitchen. It’s filled with rich espresso cupboards and granite counters, a large pantry, and high quality appliances. An island breakfast bar completes the space for a modern yet comfortable family-feel. 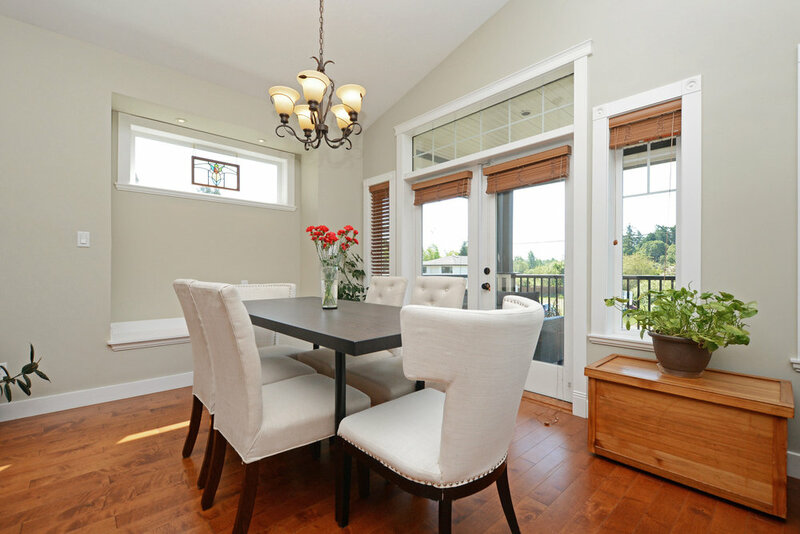 The spacious dining area is beside large glass doors that lead right onto a large covered patio. The beautiful and spacious backyard is the perfect playspace for younger kids and wonderful to BBQ and entertain friends in during the hot summer months. A vaulted ceiling and amazing windows allow light to flood into the main living space, giving it a bright and happy atmosphere. The main room has a gorgeous fireplace, and this level contains three of the home’s four bedrooms and one of its two bathrooms. The lower level is just as bright and open as the main level with a full height ceiling complete with a den, powder room, and legal self-contained one bedroom suite upgraded with an amazing built in wardrobe equipped with separate laundry and private entrance. The generously sized garage and amazing curb appeal finish off the magnificent details of this executive home.